This is replica civil war currency. These are modern day reproductions of historical bank notes. During the time of the War Between the States, there were thousands of banks that were authorized to issue their own currency. Depending on a local population's opinion of a particular bank's solvency, one might find currency from his town rejected somewhere else. 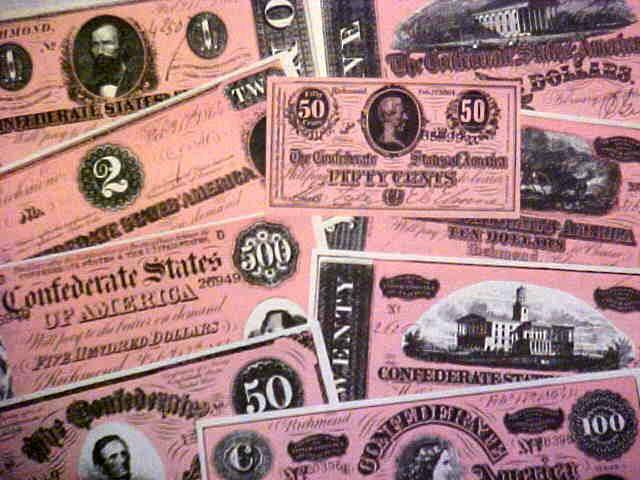 As well, in The South, individual states issued their own money as did the the Confederate government. The diverse notes in these sets show the amazing range of paper money from sometimes competing sources that circulated at the same time. Many were printed on one side only to save money! Some of these notes are accurately blank on the reverse side. There are 9 bank notes in each set. Great for kids, educational and fascinating for all. Packages include a historical overview and description of each note. Not until it became necessary to finance the Civil War, did the United States have what could be considered national paper currency. Before that the only paper money was provided by state-chartered banks estimated to number about 1500 in 1862, up from about 1400 in 1856. Many of these banks did not stand on firm financial ground, nor were all of their dealings on the up-and-up. In addition, although many notes were beautifully engraved, it was a time when printing techniques were easily counterfeited. Of the approximately 7,000 different bank notes circulating during the Civil War, About half were spurious. For this reason sometimes even "good" currency from one state was not accepted by another, or was discounted up to 50%. Numerous weekly publications called "bank-note detectors" listed "bad" money. Merchants could also look for bank failing listed in their local newspapers. 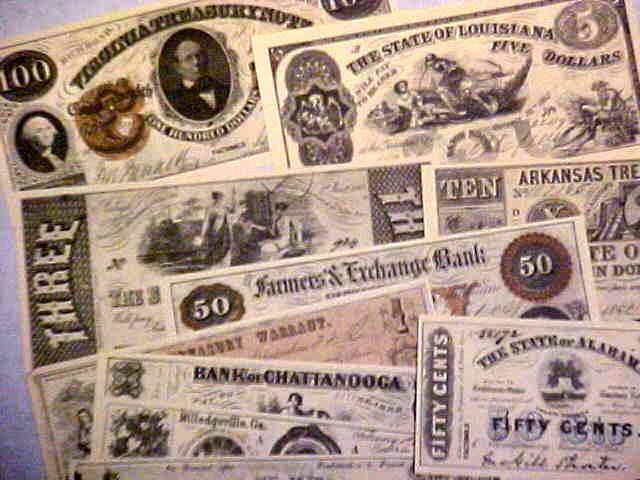 In 1865, Congress placed a prohibition tax on state bank notes. This led to the development of the familiar checking account business as a substitute. Between December, 1860, and April, 1861, eleven southern states seceded from the Union and formed the Confederate States of America. Although paper money had played the same role in these states as it had in the North, the Civil War (1861-1865) was to place a heavier financial burden on the South. "The currency of the South reflects the buoyant hope and utter despair of a people who staked their all and lost. It is the symbol of expectance and of tears. The Civil War left the South with commerce destroyed, credit impaired, and with production almost at a standstill." 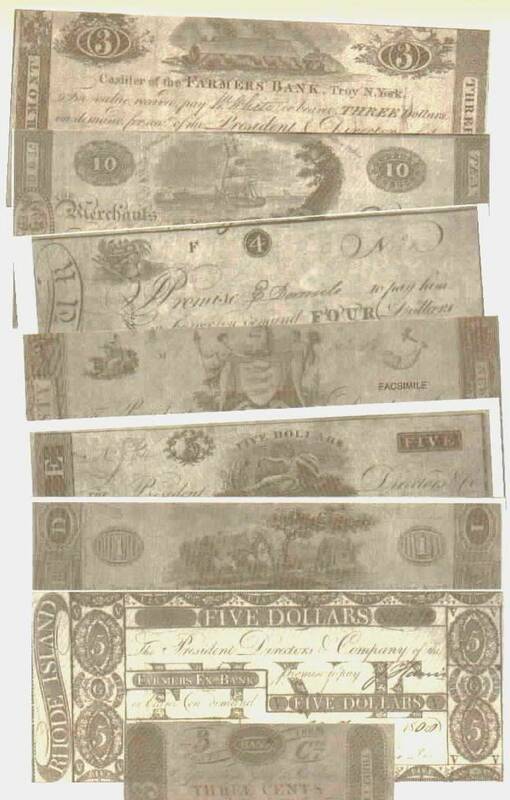 The notes in this series were issued by the individual Southern States (except the SC and TN). Most of them are very attractively engraved. 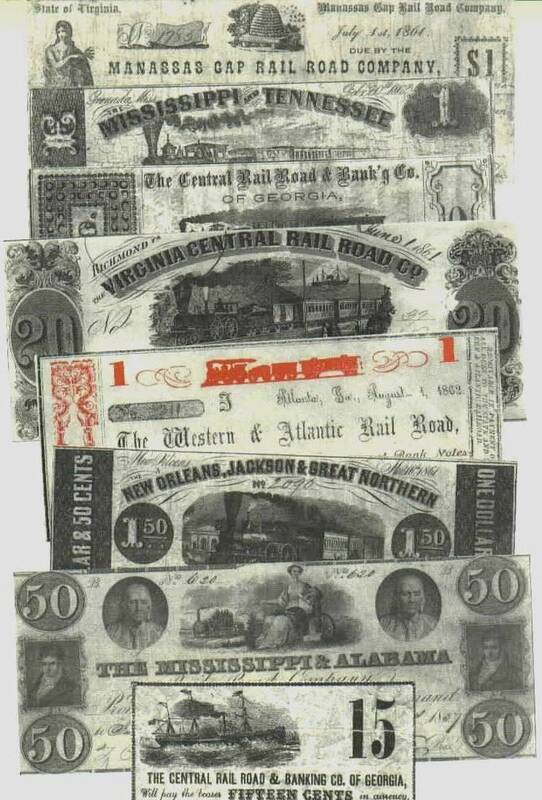 In addition to these, paper money from the central government, banks, towns, counties, and private individuals was circulating; however, by the end of the Civil War, all Confederate currency became worthless. Confederate currency played an important part in purchasing the material with which to wage war. The First Issue was authorized by the Act of March 9, 1861, and some of these notes were actually printed in the North by the National Bank Note Company of New York. Through the next six issues a total of about $1,554,000,000 was authorized to be printed. Whatever gold value the Confederate money had had dropped from 90 cents on a dollar in 1861 to 4.6 cents in early 1864, to only 1.7 cents in 1865. As just two examples of the rampant inflation, butter cost $15 per pound, and shoes $125 per pair in May 1864. For many years before the Revolutionary War, paper money or "Bills of Credit" had been circulating in the American Colonies. Most were issued to pay for military emergencies, or were authorized to build or repair public works. In many cases it also filled the void caused by shortages of coins. With the beginning of the American Revolution, each state issued its own paper money to cover military and governmental expenses. These issues were entirely separate from those authorized by the Continental Congress, and numbered over 100 from 1775 to 1781. Surprisingly, the paper money from one state circulated relatively freely in other states; however, by the end of the War most of it was virtually worthless. From 1775 to 1779, the Continental Congress issued $241,552,780 worth of Continental Currency in eleven different printings. 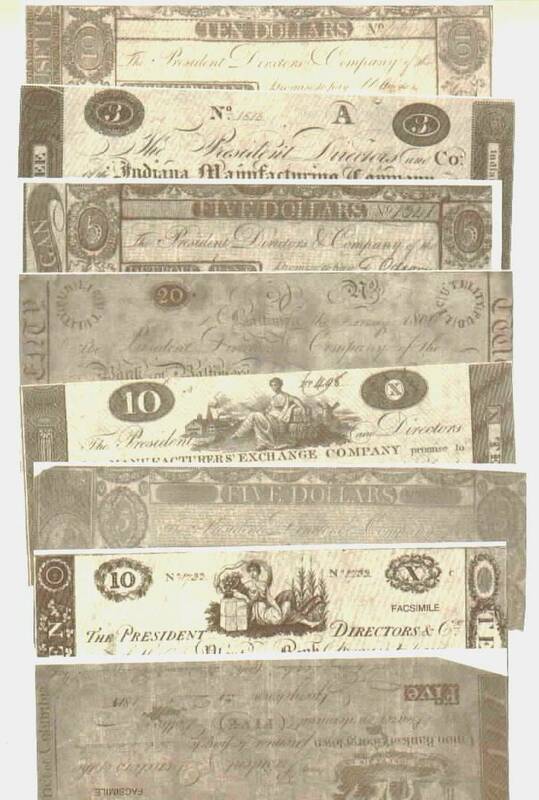 Because coins were so scarce during the American Revolution, these bills and the state issued notes were practically the only money in circulation. Anyone refusing refusing to accept the money was branded a traitor and a Tory. For 1 ½ years Continental Currency circulated at face value, but beginning in 1777 it steadily lost value until by 1780 it had declined to about 1/40th of its original buying power. Thus we have the familiar phrase, "Not worth a Continental". Some of the decline can be attributed to English sponsored and encouraged counterfeiting. Every denomination of Continental Currency has its own unique emblem and motto on the front. The back are decorated with nature prints of leaves. Beginning with the May 20, 1777 printing, the words on the front in the top and bottom borders were changed to read "United States" instead of "United Colonies". 3 issues for New Jersey – over 200,000 pieces. The face value of these printings amounted to 903,410 English pounds. In addition to the purely business side of contracting for printing work, Franklin introduced new methods that improved the quality of paper money and also helped deter counterfeiting. Wasted paper and labor were kept to a minimum by careful registration. Intentionally misspelled words and a combination of different set type styles and special engravings made exact duplications by forgers difficult. 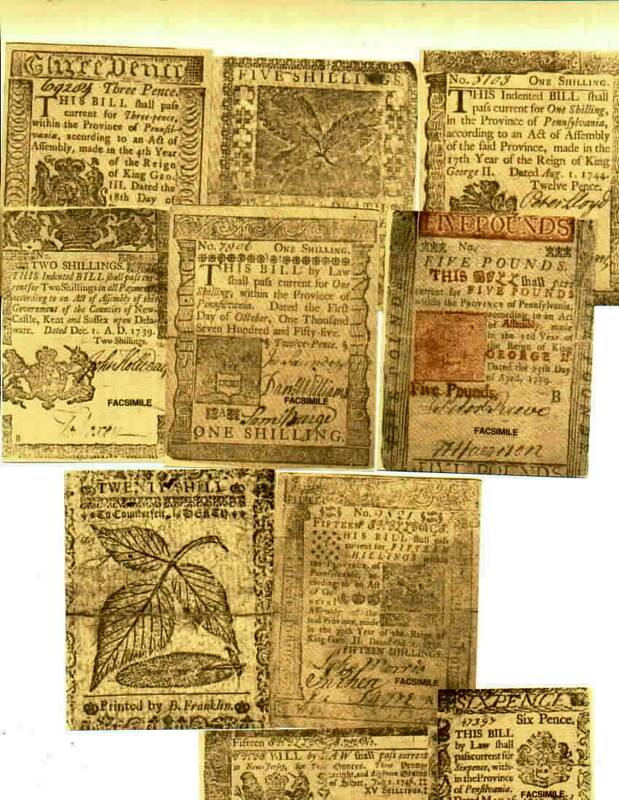 Nature-printing on paper money was probably first used by Franklin on the New Jersey issue on March 25, 1737. The process of forming a lead printing plate from a plant leaf was a secret technique developed by Franklin. Since no two leaves were exactly alike, nature-printing on paper money gave major protection against counterfeiting. During the American Revolutionary War (1775-1783), The states and the U.S. Continental Congress printed millions of dollars worth of paper money in order to finance the war. But, most of this money became practically worthless and Americans began to describe useless things as "not worth a continental". After independence, it was about 75 years until the Federal government again issued paper money. In the meantime, citizens conducted their business by relying heavily on the use of coins (U.S. and foreign) and paper money issued by banks. 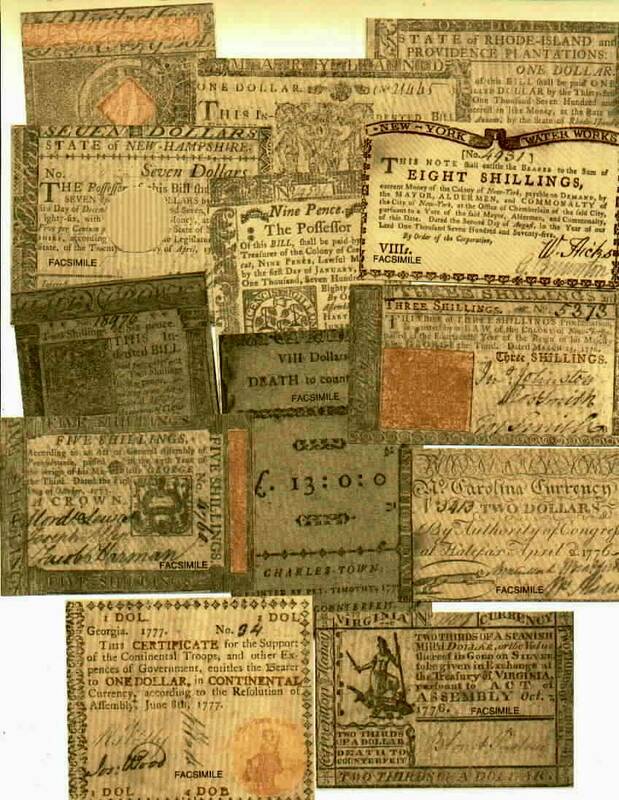 In addition paper money was also issued by private companies, merchants, churches, and municipalities. 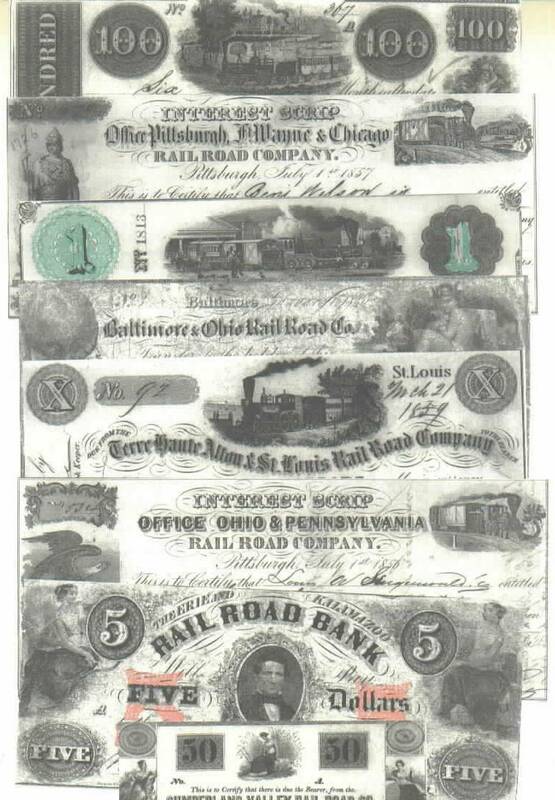 Many of these notes were used to "make change" when there was a scarcity of coins, pay invoices for freight or transportation due to a railroad company, or were actually investment receipts for stock and interest payable to the bearer if they accumulated enough. All in all, this made for hundreds of different and interesting designs of paper money in circulation. In 1865, Congress placed a prohibitive tax on most state notes, and this led to the development of the familiar checking account business as a substitute. During the American Revolutionary War (1775-1783), The states and the U.S. Continental Congress printed millions of dollars worth of paper money in order to finance the war. But, most of this money became practically worthless and Americans began to describe useless things as "not worth a continental". After independence, it was about 75 years until the Federal government again issued paper money. In the meantime, citizens conducted their business by relying heavily on the use of coins (U.S. and foreign) and paper money issued by banks. Banks were created by wealthy men who agreed to pool their resources and lend it to others for a short time for a fee. The oldest banking institution in existence today was chartered in Pennsylvania in 1782. Loans by banks were usually made with paper notes with the name of the bank printed on them. Bank notes were then used by the borrower and others to pay debts and make purchases, just like the notes were "real" money. The bank promised to exchange its notes on demand for gold or silver coins, however, many banks did not keep enough coins on hand to do this. Bank notes were then sometimes redeemed for less then the face value, or the bank was forced to close its doors. Failed banks were often known as "broken banks" and their paper money was worthless. By 1800, there were 28 private chartered banks in the U.S., 89 in 1811, and the number grew to 208 by 1815. 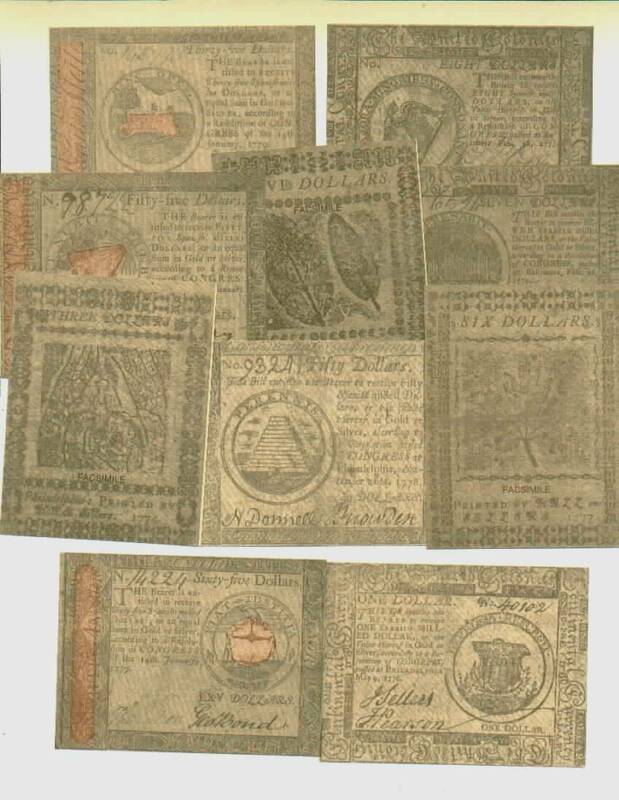 During the War of 1812 era, paper money was also issued by private companies, merchants, churches, and municipalities. This made for hundreds of different and interesting designs of paper money in circulation. This is replica civil war currency. These modern day reproductions of historical bank notes are clearly marked "Facsimile" in a manner subdued enough not to ruin their genuine appearance. Yet they have wonderful graphics that seem true and are sure to evoke the historical feel for which they are intended. They have no antique or numismatic value. They are a wonderful value for what they are: educational, fun keepsakes and conversation pieces suitable for play or study aids. Great for reenactors. Again, we sell FAKE Confederate money. For genuine Confederate money, contact Crutch at his website above. Tell him The Flag Guy® sent you. We have authentic looking Confederate play money and Union play money. Crutch has real Confederate money and knows a whole heap about it.